If you actually share this with some friends, tell me. I did a cartoon booklet about this subject which I’ve shown almost no one – but the one or two who saw it laughed a lot. We’ll use it some day in some campaign I guess, but not yet. But if you help me bring the news about this book club to a lot of English and/or German speakers, I’ll secretly send you a private pdf. Don’t tell. Barbara I will pass this on to the most connected person I know in Calgary. It will definitely get around. I got your email! I’ll be sending you the cartoon booklet today! You’ll be the 4th person to ever see it so let me know if you like it. I found your email address too, Arndt! Look in your inbox today for the pdf of the cartoon booklet. You’ll be the 4th or 5th person to ever see it. (Forgive the scratchouts, I’ve never cleaned it up because I did it just for myself.) Tell me if it makes you laugh. And thank you for helping spread the word about the book clubs. Only 4 days to go before the doors close for maybe a couple of years! Did you all click on the book covers? Isn’t that clever? I praised the devil out of Patty when I first saw that last night!! “…mention in those German FB sites that you are sending them to a *bilingual video. * Of our 1250 visits to this page, only 335 have watched the video. If any of you get a chance to share this link with your Facebook friends, or email it to anyone you think might be interested, that would be just great! We have only 5 days until registration closes and I’d love to fill up the book clubs because they are so incredibly great to be in! This book is called (by many on amazon.com) my masterpiece. I’m proud of it. And it’s important. It makes a huge difference to people who are giving up on themselves so early in life! I love it when you say it is selfish not to do what you love. It is so easy to convince oneself that the opposite is true. Even though I am actually quite good at encouraging others to do what they love and have helped many do exactly that..I still keep trying to make myself the exception to the rule and feel guilty doing or trying to do more of what I love. Is it too late? 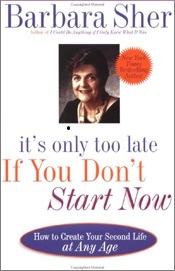 I heard recently that it is only too late if you don’t start now…LOL….another great pearl of wisdom…thanks Barbara! 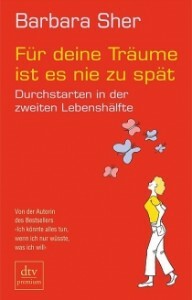 I am happy to have the chance to start “now” again with this next bookclub! As I have found – and need to tell my coaches over and over – being able to help others is so much easier than trying to help yourself. The two processes are so different they’re hardly related. You don’t get 1000 muffled memories from infancy through childhood and adolescence when you show someone else who he is and why he should do what he loves to make his contribution and be happy, or when you make is safe for someone to do what she really loves without feeling selfish. When it comes to helping ourselves, it’s exponentially harder, maybe impossible. A totally different process and one I advise that you ignore. If, when you read my stuff, it makes you feel safe to do what you love for a while, that’s great! Read it more often! Otherwise, forget it. The more people you help, the easier it gets — almost unconsciously – to do what you love, too..
Thank-you so much! More great insights that make a lot of sense and looking at things from the perspective you provided makes me feel a lot better! And by the way…I think the combo of “read it [Barbara Sher stuff] more often” and continuing to help others is a great little plan for me. I am also finally inching closer to a good enough or better-than-good enough job which will help a lot too. The specialist that I want to work with is an Surgeon that selciapized cosmetic and reconstruction. When I was taking my nursing degree in my homeland. I always wanted to become a OR nurse or working inside the operating room assisting the surgeon. I saw different kind of surgery procedure that interesting and inspired me. For example you are working with a cosmetic and reconstruction surgeon, I admired the surgeon who specialist cosmetic and reconstruction because they have work hard and plan very well how will the procedure will successful, but the most part that I always wanted to see is the out come and how does the patient happy and affect or change their life after the procedure. Thanks, LisaMancelyn! These book clubs are indeed like play. Such great people and such wonderful exercises and readings. I was signed up for your book club in the fall, and never actually did it because I had an accident, then surgery (ankle fusion), then percocet and just couldn’t focus to do the class. As you are doing the class again, would be possible to register at a discount? I’m sure Patty has a whole wonderfully good procedure for that, which will make you very happy, Elaine. Can you write her? If not, I’ll copy this into an email and send it to her. What a great story, Carol!!! Thank you!! Don’t fall into that trap, Angelique. (Too many of us have done that!) Did you read about the woman in the Sheridan bookstore, above? It’s a perfect example of what people really think – when they’re as young as you are, but also when they’re so much younger than they realize, like 45 or 60! I’ve never seen it said better. Thanks for the great article. I am 63 years old and have just started a new business making upholstered headboards with very little money. I studied interior design in Australia 16 years ago and just as I was beginning my new career I fell backwards off a mezzanine floor and ended up with all kinds of upper body injuries. I then went on to recover slowly with fibromyalgia. I could not continue with what I had been doing so I then studied NLP, mind body connection, therapy etc. I met a man who had a business making beds and his clients asked if he made headboards, so he asked if I could make one. And so started my new venture. Despite some physical handicaps I am amazed that slowly I am finding that I can do many jobs I thought were impossible. I am doing repetitive work and lifting big heavy boards ( I am under 5 foot tall and very small) I am back doing what I was created for, making beautiful design pieces and working with colour and fabrics. I am in heaven. hi gail, where are you located? thanks, hope business is going well.. do you have a website? Wow, Gail. I’m the same age and thrilled for you. And I love the idea of an upholstered headboard, as I read in bed a lot. thanks again for the reminder… i needed that today.